For a destination that has only experienced large-scale tourism for a few years, St. Kitts has a surprisingly diverse range of attractions and activities for visitors to experience, including a well-preserved British fortress, hikes to an extinct volcano, and of course day trips to neighboring Nevis. Here's a list of fun things to do while visiting St. Kitts. Towering above the St. Kitts coastline is the massive Brimstone Hill Fortress, built by the English to defend the island against French attack in the 18th century. The complex, especially the central Fort George, is remarkably well-preserved and gives visitors a real sense of what garrison life was like for the soldiers, family members, and slaves who lived in the citadel and beyond. The views from atop the fortress -- a UNESCO World Heritage site -- are outstanding. A museum includes a short film, and visitors can explore intact officer's quarters and even a vintage (and still functional) indoor latrine. One of the most beautiful spots on St. Kitts, Romney Manor is home to the Caribelle Batik Factory. Artisans use hot wax and dye to create distinctive and colorful batik fabrics and patterns, most commonly for dresses and shirts but also for pillow covers, scarves, wall hangings, and more. Every visit to the shop starts with a batik demonstration; visitors are then welcome to wander the store and grounds, which includes the ruins of a historic sugar plantation and paths to a nearby rain forest. Just outside the gates, you'll find pre-Columbian petroglyphs left by the Carib Indians. The St. Kitts Scenic Railway, a.k.a. "The Cane Train," is a great way to take in the scenic beauty of St. Kitts while experiencing a little history, as well. Up until very recently, sugar was king in St. Kitts, and many parts of the island are still planted with shimmering fields of sugar cane. The Scenic Railway operates over narrow-gauge tracks once used to move the cane from the fields to processing plants in Basseterre. Passengers sit in covered, open-sided cars for the tour, which includes passages over skinny bridges, vistas of ocean and rain forest, and brief sprints through small towns. There is some nightlife in Basseterre and at the St. Kitts Marriott Resort, but the beach bars along Frigate Bay are where the real "limin'" action is. Mr. X's Shiggity Shack is probably the most famous, with its Thursday night bonfire and great lobster and barbecue dinners. Ziggy's starts the party early; this open-air bar serves breakfast, lunch, and dinner as well as cold Carib and Stag beers. Rainbows is known for its Friday night DJ-led dance party. The Monkey Bar attracts both locals and tourists, while the Oasis Sports Bar is the best place to catch your favorite game on TV. Basseterre is as authentic a city as you will find in the Caribbean, easily accessible to tourists but not yet a Disney-fied tourist destination. Start your walking tour at the Circus, the bustling town center with the much-photographed Berkeley Memorial at its heart. There's a Caribelle Batik store on the circus; upstairs is the Ballahoo Restaurant, with great views of the town. Small shops line Fort Street and Cayon Street, including Kalabash, known for -- of all things -- its cheesecakes. Be sure to visit Independence Square, the town green lined with historic Georgian homes and public buildings. 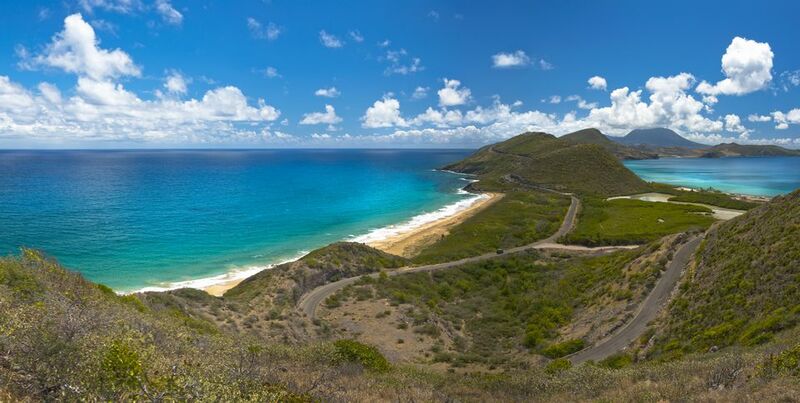 Frigate Bay marks the beginning of the sinuous Dr. Kennedy Simmonds Highway, a scenic road that provides access to the largely undeveloped southeastern end of St. Kitts. Generally more arid and rocky than the rest of the island, this peninsula is home to secluded beaches, herds of grazing goats, and a handful of local hangouts like Turtle Beach. The beach is a skinny little strand, sometimes frequented by cows as well as tourists, but the neighboring bar and grill serves great conch and lobster dishes, and its worth a visit just to see the giant pig and wild monkeys in residence. Amid the cane fields and rainforest that make up the St. Kitts backcountry, you'll find a pair of historic plantation homes that offer both lodging and fine dining in a peaceful colonial setting. Rawlins Plantation has guest rooms built into a former sugar mill and bakery as well as a buffet-style lunch featuring curried chicken, sweet ginger meatballs, fried fish fritters, beans and rice, and fried plantains, among other local specialties. Ottley's Plantation boasts luxury accommodations and the indoor-outdoor Royal Palm Restaurant, serving "New Island Cuisine" poolside. Looking for a bit of adventure during your St. Kitts visit? Ask your hotel concierge to recommend a local guide and set off for a hike through the rainforest to the peak of Mt. Liamuiga, a dormant volcano that serves as the island's 3,800-foot (above sea level) spine. The hike can be challenging, but you'll be rewarded with panoramic views of neighboring islands like St. Maarten and Saba. Ambitious climbers also can opt to use supplied ropes to gently rappel down inside the slumbering crater of the volcano, now covered in lush vegetation. St. Kitts is slowly emerging as a dive destination, with a good range of scuba and snorkeling opportunities, from beginner to advanced. There are both reefs and shipwrecks to explore; the Coconut Tree Reef is just 10 minutes offshore by boat. You also can dive a wrecked tugboat and the split remains of the River Taw, a 144-foot freighter that sunk in 1985. Local outfitters include Dive St. Kitts, ProDivers St. Kitts, and Kenneth's Dive Center. Just 2.5 miles off the southeastern tip of St. Kitts is the sister island of Nevis, which can be reached via a 45-minute ferry ride from Basseterre to Charlestown. Nevis is a destination in its own right, but daytrippers can still enjoy nature hikes, the lush botanical gardens, and the reconstructed Herbert's Heights village with its spectacular views from atop Nevis Peak. Nevis also is home to a number of historic homes -- in Charlestown and beyond -- some fascinating museums and is a history buff's delight with its many ruins and sights related to Lord Horatio Nelson, who married here.